Genes, Brain Function, and Behavior offers a concise description of the nervous system that processes sensory input and initiates motor movements. It reviews how behaviors are defined and measured, and how experts decide when a behavior is perturbed and in need of treatment. Behavioral disorders that are clearly related to a defect in a specific gene are reviewed, and the challenges of understanding complex traits such as intelligence, autism and schizophrenia that involve numerous genes and environmental factors are explored. New methods of altering genes offer hope for treating or even preventing difficulties that arise in our genes. 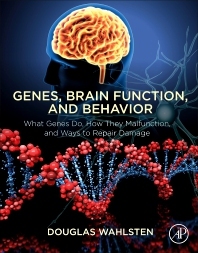 This book explains what genes are, what they do in the nervous system, and how this impacts both brain function and behavior. Dr. Wahlsten received his Ph.D. degree in psychology from the University of California Irvine and completed his postdoctoral work in behavior genetics at the Institute for Behavioral Genetics at the University of Colorado. He then established research laboratories at the University of Waterloo, the University of Alberta, and the University of North Carolina. The laboratory work involved genetic and developmental analysis of mouse brain defects and methods of behavioral testing. He also acquired expertise in statistical data analysis and theoretical issues central to the field. He was a co-founder of the very successful journal Genes, Brain and Behavior, and was given the Distinguished Scientist award by the International Behavioral and Neural Genetics Society. Throughout his career, he has taught behavioral and neural genetics to undergraduate and graduate students.